To be sure, 1966 was an inspirational year for the UK. Not only did England win the World Cup, but Palitoy launched the Action Man. Over the years a pristine vintage Action Man has become about as rare as an England victory in a major tournament. A much sought after 1960’s first wave Action Man figure mint in the box can today easily sell for a four figure sum. Not surprisingly, comparing todays HM Armed Forces figures with the vintage 60’s Palitoy Action Man you’d have to conclude that the detail and articulation on the HMAF figures is far superior. 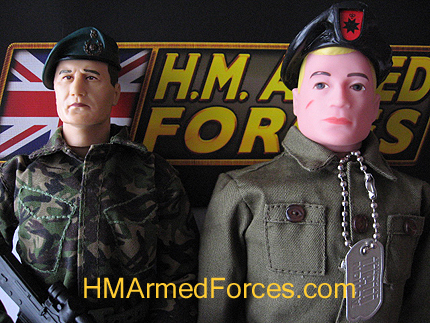 Just as Palitoy introduced a number of innovations over the years – gripping hands, flocked hair, eagle eyes, talking figures – let’s hope that Character do the same for HM Armed Forces. After all, Character Options award winning Doctor Who action figures have undergone continual refinement in terms of their sculpts, paintwork and articulation since they first launched in 2005. 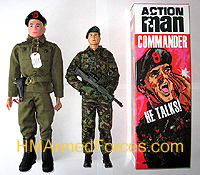 If HMAF thrives and develops like the original Action Man then 2009 will in time be remembered by fans as fondly as 1966.